Gorilla trekking safaris, Uganda tracking tours, permit bookings, group budget safaris and luxury Uganda tours and trips to bwindi jungle. The safari begins and ends from Kampala or Entebbe at 8:00 am you're picked from your hotel or residence. Drive to Mbarara (283km from Kampala) via Masaka. Make a first stop over at Equator crossing for snacks and photography. Lunch break is created at Regency hotel or Agip motel Mbarara. 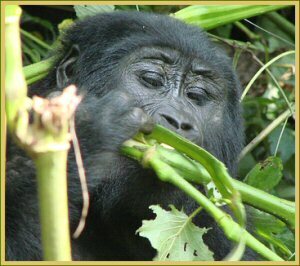 After lunch, drive to Bwindi. This can be the lushest highland rain forest on earth, full of primates and birds, valleys, hills and swamps full of papyrus. You’ll be able to conjointly spend your afternoon having a walk round the village and seeing the local communities living round the park. Dinner and over night at either the gorilla resort Republic of Uganda safari lodge/ Mantana Tented Camp (High end/luxurious accommodation), or Lake Kitandara Tented Camp/ Buhoma Homestead (Medium category accommodation) or the Community Banda’s (Low budget/basic accommodation). Have AN early breakfast and get prepared for trekking, that begins at 8:00 am with a meeting from the UWA employees. Guarantee to carry along with you rain jacket, drinking water, snacks, jungle boots etc. The guides can lead you within the jungle to examine the shy Primates for a group you've got been booked for. Don’t forget to require your lunch boxes and all the required gear to track the rare mountain gorilla, maybe one of the most exciting wildlife experiences on earth. Trailing could take between two to six hours however it’s well worth the effort. Dinner and over night at either the pongid resort, Mantana Tented Camp (High and opulent accommodation), or Lake Kitandara’s Tented Camp/ Buhoma Homestead (Medium category accommodation) or the Community Banda’s (Low budget/basic accommodation). Have AN early breakfast and drive to Kampala, then Entebbe, with lunch enrooted and stop over at the drum manufacturers arriving Kampala early evening. Approximate distance from Kampala is 550 Kms.